LogMeIn Ignition is an app for remotely accessing Windows PCs(s msft) or Macs (s aapl) from a mobile device. The folks behind LogMeIn are preparing an update for the Android version of Ignition that’s fully optimized with support for tablets. We have an advance copy of the update, and offer this sneak peek at LogMeIn Ignition running on a Samsung Galaxy Tab. I reviewed the Android version of LogMeIn Ignition prior to the release of the initial version several months ago. The review was conducted using the HTC Evo 4G smartphone, and in spite of the small display, I found LogMeIn to be a useful tool. I’m using the Galaxy Tab with a 7-inch display for this advance look at the tablet optimizations, and the screen is wonderful for remotely accessing desktop systems. I’ve controlled both my dual-screen Mac setup and a Windows PC from the Tab without issue. LogMeIn is fully optimized for touch control, effectively turning both Macs and Windows systems into touch tablets. The app provides complete control over the remote session, from how the remote mouse behaves to changing the screen resolution of the remote system to more closely match the Android device. Moving around the remote desktop is very fluid, and as simple as dragging the desktop around the tablet screen. 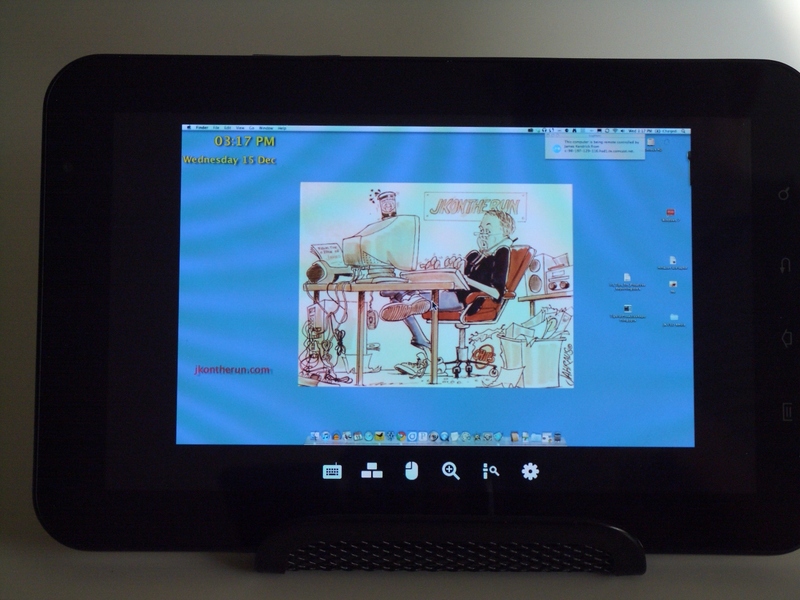 All mouse operations are replicated on the Android touch screen, allowing full interaction via LogMeIn. LogMeIn Ignition is a good solution for technical support folks who routinely need to support client systems. It is often easier to simply take over the client system to see what’s going wrong, then fix it on the spot. It is a good tool using a small phone, and a great one using a larger tablet. The update to LogMeIn Ignition for Android should be released soon, and will be free to existing customers. You should really try PhoneMyPC (and maybe do a comparison). I find it to be the fastest and easiest to use. I use PhoneMyPC for mouse/keyboard on my computer, but the quality is pretty low, it is slow, and there are some missing features (it is in beta). It is a breeze to set up and is reasonably priced at $10 (while in beta). Lately, I’ve been using TeamViewer which is free for personal use (commercial license fees are hefty). The quality is perfect and the control mechanisms are outstanding. It is NOT a market app and must be sideloaded which is no problem on my Evo. I would highly recommend TeamViewer although PhoneMyPC is great as a keyboard/trackpad fill in. Like Sam Hill, I use PocketCloud and like it a lot. To Rodfather’s reasons for going with LogMeIn, PocketCloud also has a super simple to setup and use alternative that solves the same challenges as for those who can’t or don’t want to use VNC or RDP. It’s called Auto Discovery and requires installation of a companion app on the PC or Mac. I use the free version of Wyse PocketCloud on my Galaxy tab. It works very well (acts as an RDP client). The key advantage (aside from the price) is that there is NO middleman, as in the case of LogMeIn; connection is directly from the tablet (or phone) to the PC. Performance is excellent. That’s the reason why I went with LogMeIn. It was a pain to set up RDP or VNC. Before I had to open ports in my router and forward those ports to the machine I want to remote into. Then create a dyndns entry for each computer so I don’t have to remember the IP address. Then there’s the issue of VPN’ing into secure networks before being allowed to remote in. With LogMeIn, it’s just a matter of installing the app. You’re left with a single login to access all your computers. The connection between the computer is direct, it’s just the authentication and pairing is done on their servers. Understood — that makes perfect sense. In my case, I am connecting with my AWS EC2 (Amazon Cloud Computer). With EC2, it is actually very simple to connect via RDP since that is the default means of connecting to your Windows EC2 instance anyway and there is plenty of security built in. The cool thing about RDP is that it comes with Windows (except Home versions), so it’s pretty easy to use and there’s nothing else to install (or buy) on the PC side. I have tried most all of the Android RDP clients in the Android Market and they are all pretty easy to configure and are efficient and reliable (I like Wyse the best, though).